Women apparently own on average, 20 pairs of shoes. Men, on average, own 12 pairs. I own 13 pairs of shoes. I’m a guy so I’m spot on in the average range. That means the average adult couple has a combined 32 pairs of shoes kicking around the house. If there are kids, add another 10 to 20 pairs. That’s upwards of 50 pairs of shoes in the house. Yikes, that’s literally a mountain of shoes. No wonder shoe storage is such a popular topic. Shoes currently in use: These are the shoes and boots you’ll realistically wear within the next month or even week. They should be put in a convenient place near your home’s exits. Viable storage mechanisms include cabinets, benches, and trees. Shoes not in season: These are the shoes you definitely won’t wear for the next few months due to weather. These are shoes you can safely stash away under the bed or in boxes. Event shoes: These are shoes you may wear in any given week; perhaps dress shoes or some sport shoe you use for a specific activity. 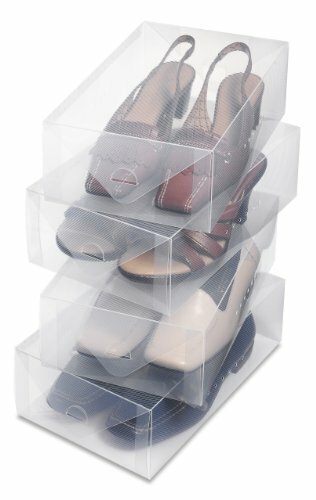 These shoes you want to store in a place that’s convenient to find (i.e. not stashed way under your bed), but also not taking up valuable entryway space. Viable options include in your closet, a footlocker, shoe rack or shoe cabinet. Now let’s dive into the specifics of shoe organization options. There are many. Our list below includes photo examples. 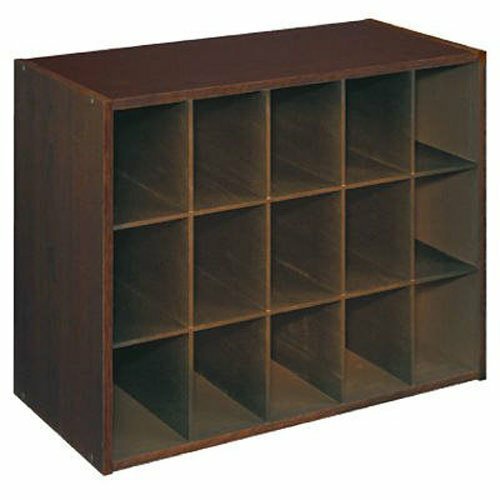 Racks come in all sizes, materials, capacity and styles. They’re usually not the prettiest given they’re geared toward storing many pairs vs. looking good. I tend to prefer the wood varieties. As for size, a lower rack is better for a foyer or mudroom, but a tall rack could be good in a bedroom or storage room. 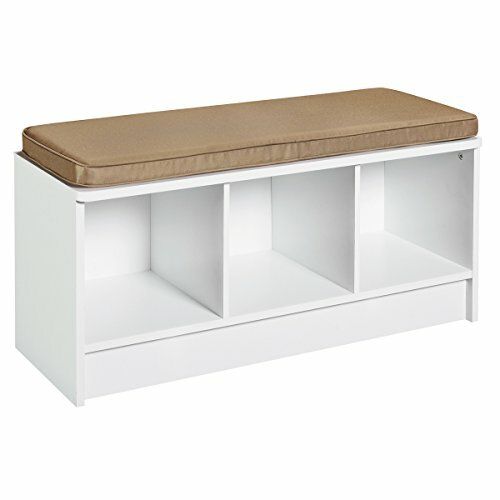 The open shoe rack is a very simple structure – a frame with shelves or bars. It’s not enclosed. These can look great like the one below and are fairly inexpensive. Racks are also great because you can store a lot of shoes in very little space. They’re one of the most efficient options. A closed shoe rack is more like a shoe shelf. 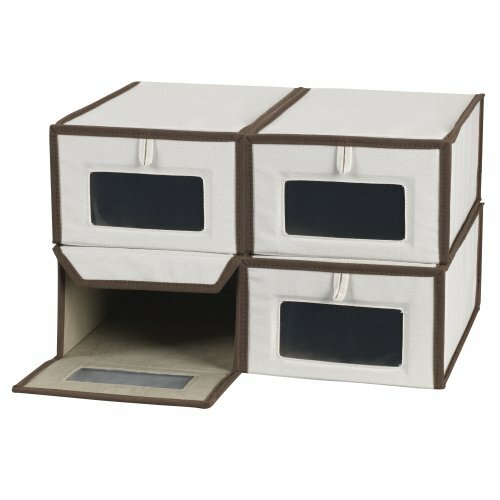 It offers cubbies or contained sections for each pair. 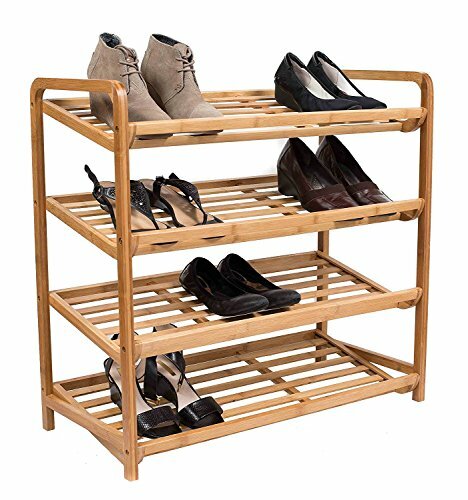 For the ultimate in shoe storage efficiency, check out this revolving shoe rack. The bench solution is ideal for mudrooms and main entryways. They serve as a seat and storage. We have one in our foyer and it’s fantastic. 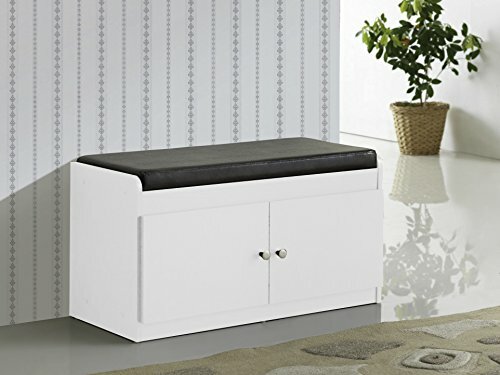 I’m a HUGE fan of storage benches because they look good, I’m always game for having a seat and they store stuff. They’re what I call a triple threat in the world of storage. There are three basic types – open, partially open and closed. Here are examples of each. The hanging shoe organizers are efficient because they are placed in locations that are otherwise wasted space and can store many pairs, but I find them clumsy. We have several of these and I don’t use them. The hanging rack is my favorite hanging type of shoe storage. That doesn’t mean much because overall, I’m not big on any hanging storage. I don’t like things clanking on the door when I open or close them. The pockets look like a good idea, but I’m not a big fan. Maybe because my shoes don’t fit in them well. As you can see below, they really only accommodate flatter shoes. Don’t expect to get your large sneakers or hiking shoes in there. And yet another seemingly good idea, but we have these hanging shelves and I fnd they are flimsy and take up a lot of space. I prefer a rack or cabinet any day of the week. These are flat storage options that slide under beds. They’re all pretty much the same in shape except some are larger (i.e. more storage capacity). TIP: Get one with a clear top like the example below. This saves you time looking for something in the event you have several of these under the bed or in the closet. Footlockers can store all kinds of things. They are basically large chests and come in wood, metal or plastic. I love the wood ones. Some are plain and only functional while others are stylish and can double as a piece of furniture. Our example below doubles as a coffee table. Boot trays don’t store all that much but they help protect your floor from water and mud. It’s good to have one or two of these in the house during wet months. Here’s a stylish example. If your budget allows and you have well above the average number of shoes, you might get a built-in shoe shelf in your bedroom, closet or elsewhere. Below is a great example of such a shelf. By my count, the example below stores about 50 to 54 pairs of shoes and boots. Notice the boot storage bottom shelf. If you’re designing a closet, be sure to reserve some storage space and features for shoes. Below is an example of squeezing in some shoe shelves within the massive organization system. See more closet systems here. The ultimate shoe storage is a custom design and built shelving and cabinets in a large walk-in closet. Take a look at the example below. Now that’s an elegant way to organize your shoes. I count 40 pairs of shoes stored in the example below. It’s easy to access and everything is immaculately organized. As you can see above, some shoe organizers look better than others. The high storage volume racks for 50+ pairs don’t look all that great. You wouldn’t put them in your foyer. 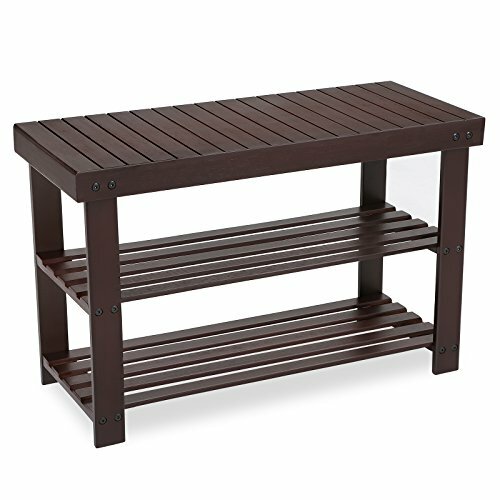 A nice shoe bench, on the other hand, looks great and goes pretty much anywhere. How many pairs to store? 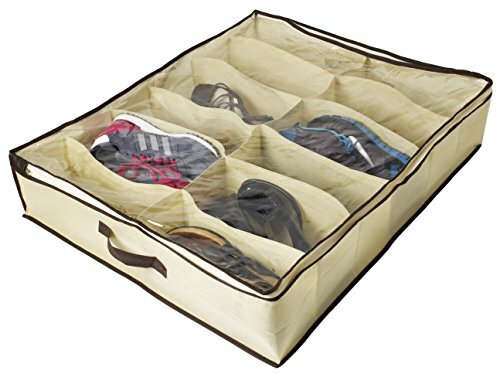 The biggest issue you need to decide is how many pairs of shoes you need to store and where you want to store them. Perhaps you have 80 pairs of shoes you want to store and another 10 pairs that you use regularly (via rotation). That makes it easy – get a couple of huge racks and then a fashionable organizer for the foyer or mudroom.